Call Me On The Yacht: Whatcha Got There? 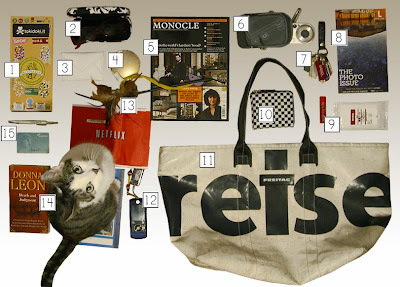 Ah yes, the photo of a person's bag and all the junk normally contained within. How very original, how very telling, how very whatever. So I've submitted to a curiousity I've had for a while, of what my usual everyday crap would look like given the same treatment as the crap of famous designers and people. You know the spreads: Japanese bag company Porter does them for their seasonal "Perfect Book," Monocle copied off of Porter and now features them in every issue, and there's Sophia Calle's contracted-out Chanel project of buying people's bags straight off of their arms and then displaying the contents. Above is my contribution to the trend, and it is very true (aside from the cat). From this, I can deduce two things about the owner (myself): She is lazy (didnt bother to get the recent L Magazine, takes forever to read Monocle, hasn't yet returned netflix, won't play with playful cat, doesn't put on more makeup than chapstick) AND she is miserly (won't spring for a new camera or iphone even if it will improve her quality of life tremendously, luxury items pictured all purchased on deep sale discount, doesn't have an "it" bag). Yet, I couldn't be happier with it all. Did I see a Borders Rewards keychain card on there? Classic. Just discovered your blog and LOVE IT!